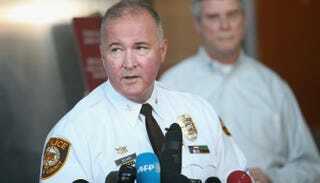 St. Louis County Police Chief Jon Belmar takes questions during a March news conference. Two St. Louis police officers shot and killed a 23-year-old man after he allegedly charged at them brandishing a knife, Police Chief Jon Belmar said in a statement early Saturday, according to NBC News. In an effort to quell protests in a state beset by complaints of brutality, police posted what they said was body-cam video of the Friday-night shooting within hours of the incident, the report says. The incident occurred about 10:30 p.m. after police responded to a call from a woman who asked that her son, Thaddeus McCarroll, be removed from her home. McCarroll, who had been talking about going on a "journey" and mentioned "black revolution," had allegedly locked her out of the house and was walking around the house with several knives and a Samurai sword, NBC writes. Officers responded to the scene and requested support from the force's Tactical Operations Unit, which began to negotiate with McCarroll, police said. "After approximately one hour of negotiations, the subject exited the residence armed with a knife in one hand, and a Bible in the other," the statement reads. Officers then tried to get McCarroll to drop the knife, firing a "less lethal round" at him in an attempt to disarm him and ordering him to speak with them without holding the knife—but that didn't work, police said. Law-enforcement officers in Missouri and across the country have been under intense pressure to be transparent in the aftermath of the shooting death of Michael Brown, an unarmed black teen who was killed by a white officer in the St. Louis suburb of Ferguson on Aug. 9, 2014, the report notes. The shooting death sparked nationwide protests and increased scrutiny of shootings involving police and minorities.